Have you ever been asked, "Why are you still Catholic?" Well, if your answer is yes I encourage this article: Hope and Serenity among Thorns. Just click on the link and I hope you enjoy the article. Nothing else needs to be said. Simply, one must take the first step to find Christ and He will leap to you. 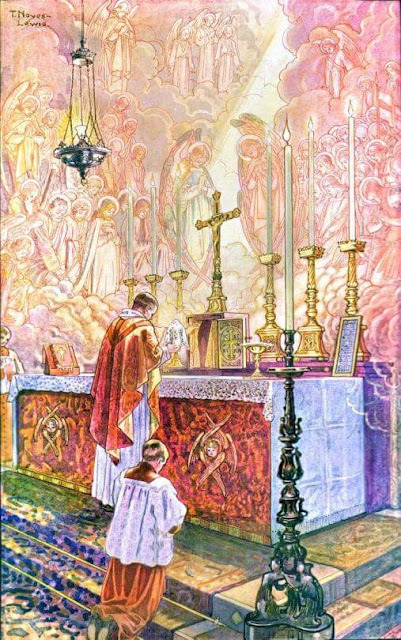 Seek out the Sacraments and the Church - it is in the heart of the Catholic Church, the Most Holy Eucharist, where Christ dwells. Seek Him and you shall find Him. In the book I'm reading to help journey through Advent, "On the Way to Bethlehem", today's short reading is centered on how to avoid becoming "soul-napped" on the way to Christmas. Christmas is the second greatest feast day, after Easter, where Our God actually came to Earth to save us. He took human form and lived for us. He lived only for us and died for us. Yet, there are still many people that don't have hope in Jesus. As the reading illustrated, the journey ahead seems long, but in no time it will arrive. Don't stand back and give up. Remember there is a right answer out there on faith. There is a God - Jesus Christ. Read the scriptures, the look at the beauty of the Catholic faith. We are rooted in Christ's beliefs; and Christ is still with us. 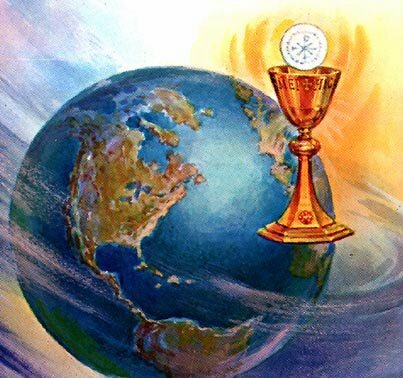 He said, "I am with you ever more" and today he is in the beauty of the Eucharist. Pope John Paul ll said, "How can they believe if they have not heard?" It is our duty as followers of Christ to at least live and active, noticeable faith in Jesus. Jesus at the end of the Gospel of Matthew told us to go out and baptize all nations. We are called to love God. We should feel no shame in at least discussing our faith and helping another to see the light of Christ. Tomorrow let us go out and perform our duties and nourish our soul before all. After receiving the shining brilliance of love in the Eucharist you can't doubt. Jesus Christ is risen from the dead and living for our lives. He is with us, the question is will you live for Him. Will you give up your comforts and care for your soul? Will you work to bring the faith so that others might know of it? Will you love Him who loved you to the death? As we journey closer to Advent let us remember to keep this first week's theme of hope rooted in our heart. May we only grow in love preparing for the celebration of the Savior of the world's birth. Today is the Feast of St. Andrew. 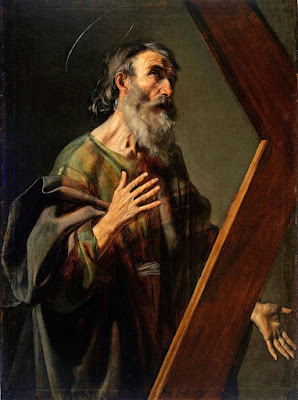 St. Andrew, the first apostle, was with our Lord throughout the His life as recorded in the Bible. St. Andrew's brother was Simon Peter, the first pope. After Our Lord's Ascension into Heaven, St. Andrew journeyed to Greece to spread the faith. He was martyred in Patras, Acaia (in the southern part of Greec) on November 30, 60 AD by Nero who bounded him, not nailed, to an X-shaped Cross. As St. Andrew suffered for 2 days, people still came to him to hear his words. He is the patron saint of Russia and Scotland. Andrew, Peter's brother, and John were the first disciples to follow the Lord. With tender delicacy the Gospel (John 1:35-42) describes their first meeting with Jesus. Andrew did not belong to the inner circle of the apostles, Peter, James and John, and the evangelists narrate nothing extraordinary about him (John 6:8); but tradition (resting on apocrpyhal Acts) extols his great love of the Cross and of the Savior; and the Church distinguishes him both in the Mass (his name occurs in the Canon and in the Libera since the time of Pope St. Gregory I who had a special devotion to him) and in the Breviary. The story of his martyrdom rests on the apocryphal Acts which lack historical foundation. The pagan judge exhorted him to sacrifice to the gods. Andrew replied: "I sacrifice daily to almighty God, the one and true God. Not the flesh of oxen and the blood of goats do I offer, but the unspotted Lamb upon the altar. All the faithful partake of His flesh, yet the Lamb remains unharmed and living." Angered by the reply, Aegeas commanded him to be thrown into prison. With little difficulty the people would have freed him, but Andrew personally calmed the mob and earnestly entreated them to desist, as he was hastening toward an ardently desired crown of martyrdom. When Andrew was led to the place of martyrdom, on beholding the cross from a distance he cried out: "O good Cross, so long desired and now set up for my longing soul I confident and rejoicing come to you; exultingly receive me, a disciple of Him who hung on you." Forthwith he was nailed to the cross. 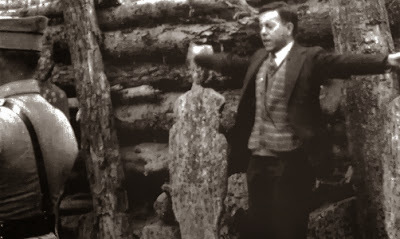 For two days he hung there alive, unceasingly proclaiming the doctrine of Christ until he passed on to Him whose likeness in death he had so vehemently desired. --The legendary account of our saint's martyrdom has this value: it presents to us the mysticism of the Cross of later times. We humbly entreat Thy majesty, O Lord: that as the blessed Apostle Andrew was once a teacher and a ruler of Thy Church: so he may be a constant advocate for us before Thee. Through our Lord. On the night before your passion you were taken from us, beaten and mocked and condemned to death. On the road to Calvary so many hated you; you almost died on the way. Your precious face was disfigured, your body beaten and riped open. O Lord, your precious hands which worked so many wonders, were pierced. On that day Lord, you liberated me. May your blessings be upon me this Advent and transform me on my pilgrimage to Christmas Day. May the grace and joy of Christmas enkindle an eternal flame in my heart for love of you and neighbor. 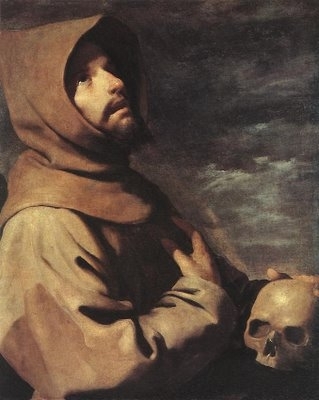 And, permit me O Lord, to die in love of Thee for Thou hast died for love of me. But, O Lord, so many hate you. So many call you false and a liar. So many pretend as if you ascended to Heaven and left us here - alone. So many pretend the Eucharist is not truly YOU. So many hate the good of your Church and deny your eternal word of scripture; so many utter lies against your faithful. Lord, so many hate you. They refuse to acknowledge you and say "one's deity" in politically correct language instead of acknowledging You, the only God to have worked wonders. But, You O Lord are the only truth. You are the only light on our journey. If I died today, would I be no more? No! For the miracles you worked are forever recorded in scripture, the miracle of the Eucharist is ever before us. May your light shine upon those that hate you, Lord. O Lord, your skin was ripped open for them. Your blood poured forth from your heart for them. 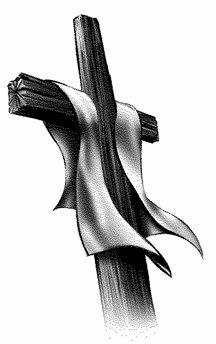 It was by your Cross alone we are saved. Lord, you need nothing as You alone are perfect. Please, permit me, if you will, to offer up the sacrifices in my life to you in reparation for those that hate you, my best friend, my love. O Lord, you let your apostles help you in the miracles of the loaves, permit me to offer my small sacrifices in union with Your perfect gift on the Cross. May my sufferings offered for you bring one soul to the truth of your Church. O Lord, grant that my work may produce much fruit and at the end, when I leave this world, you may say, "Well done, my good and faithful servant." Lord, I love you. Glory to your everlasting name! In this time, as Pope Benedict XVI has said, "We are moving towards a dictatorship of relativism which does not recognize anything as for certain and which has as its highest goal one’s own ego and one’s own desires" (Read entire Homily). Advent is a time to put aside these thoughts. There is no hope without God. Our theme this week of Advent is Hope and there is no other Hope than that of God. Some people do kind works and try and help others. I have talked before on the need to have works with faith and atheists have said that they also have works. But does this mean anything? James 2:26 states that "faith without works is dead". And of course works without faith also is dead. How could someone not believe. Since the beginning of the human race God has stood by His people and guarded them. Even when some wandered off and over time started other religions, they still had faith. Atheism is a lie of the heart and spirit and truly chokes off our love. Christ died for everyone on the Cross; He died for those that would hate Him too. My question is why don't some people care? Our beautiful faith is based on hope. Our Faith is based on Matthew 16:18 as we are the first Christian Church. And for over 2,000 years we have kept to Christ's teachings. While we are all sinners, there have been great saints in our midst. And this is one problem I have with other churches. Not only do they destroy the teachings of the sacraments and forget Mary, who stood by Our Lord His entire life, but they forget about the saints. They people were filled with such love and hope. 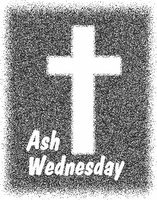 Let us, this week, nurture our souls and grow closer to God, the Only Hope. Father, in the wilderness of the Jordan you sent a messenger to prepare people's hearts for the coming of your Son. Help me to hear his words and repent of my sins, so that I may clearly see the way to walk, the truth to speak, and the life to live for Him, our Lord Jesus Christ. Amen. Advent is a spiritual time to not only help us on our journeys to Christ but bring others along. When we prepare for this journey, as a book I'm reading, "On the Way to Jerusalem" reminds us not to worry about so much to pack. Think of the love and humility of Christ. Imagine the king of the Wworld was born in a manager, a place for animals to eat. He was born in a shack in the cold of the night instead of even a building. Christ chose humility; He chose poverty to show us His love for us. Christ never even had to leave Heaven, but think about how much he loved us. Think about the Cross, He never complained but pleaded, "Father, forgive them." So, during this time of year, I would like to recommend a great book for newer Catholics called "The Confirmed Catholic's Companion: A Guide to Abundant Living". It features in-depth coverage of prayers, the basics, tradition, the Sacraments, Mary and more. It also includes great side-bar notes and a journal section at the end for readers to reflect and write down their thoughts. This is a guide for those teaching the faith to newcomers or those in RCIA or those that have recently gone through the program. For those of you hoping to rediscover the faith please try "A Faith Interrupted: An Honest Conversation with Alienanted Catholics" by Alice L. Camille. 17 million American Catholics are inactive in Our awesome faith. Let us bring someone else closer to God this Christmas. 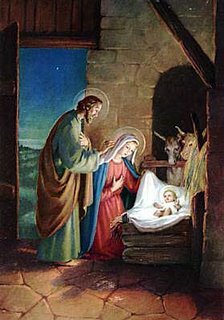 Let us pray for the poor and those in desolation and hope to rekindle our anticipation for the Day Our Savior was born to us. The day of His Second Coming is just as glorious. Let us be ever watchful. Typically some people will even read the entire Book of the Prophet Isaiah throughout Advent too. Remember, this time is all about welcome our Savior. He will come again. As today's Gospel states, "Watch!" Be ready. If tomorrow Our Lord came to judge us, would you be ready? With Thanksgiving Thursday I couldn't help to think of those people too poor to afford anything to eat. And with Christmas coming up, I realized there are people out there that won't be sharing its joy because of their poverty. Besides this, the Salvation Army has been banned from certain stores and most people have forgetten the real meaning of Christmas - Our Lord's Nativity. Basically, some people don't care and that's what I want to stop. I thought of an idea based out of a book for prayers for priests for Advent. My idea is to record our prayers for the poor on a table. Let us offer our Rosary, and Our Fathers, and Stations of the Cross and other prayers all for them. They have nothing, but Christ had nothing too in Bethlehem! We could save someone from lonliness this Christmas. The concept is to pray for the poor this Advent season as we all await the joy of Christmas. The idea comes from the metaphor that each prayer is a rose. If we offer more and more prayers we slow gather a bouquet of roses for the poor. And how beautiful roses are. St. Francis de Sales suggested gathers "bouquets of devotion" when we pray.The idea is to record all of our prayers through Advent and look at that list on Christmas morning. That will be our gift to the poor; Our Lord will certainly hear our prayers for them. Trust in God! For those of us that sat at home with our families on Thanskgiving, let us not forget of those that could not eat. Several places in my community raised large amounts of food; the food pantry was actually empty before. Please donate to a reputable organization to ease poverty. So many people are dying from it (statistics). Even Pope Benedict XVI recently reminded us to combat poverty. Christ was born in Bethlehem and chose poverty! Have mercy on His children; Adore Him! I read of an idea in a magazine on praying for our priests. There was a chart that said various prayers and included lines for the Stations, Rosary, Chaplet, etc. And, all prayers recorded on their were for priests. This year I thought about doing the same thing but for those people out there that can't have Christmas - the poor. Would anyone join me spiritually in this? On Christmas Day we can look at this sheet and see all of our prayers and know that through God's mercy someone is now better off. God requires nothing to make anything beautiful or perfect but allows us to add our own merit to His perfect one - the Cross. A: Advent is the time of preparation leading up to Christ and consisting of four Sundays. While Advent does focus us on preparing for Christmas, its primary focus is on preparation for the Second Coming of Christ. At this time of year we remember the three comings of Christ: 1) At Bethlehem as a baby, 2) Daily in the Holy Eucharist, and 3) in all-glory at the Second Coming. Advent begins four Sundays before Christmas and concludes on Christmas Eve at sundown. The typical vestment color during Advent is purple because purple is the color of royalty and leads up to the Birth of Christ, Our King. It is also a color of penance. More indepth information can be found at an article by the Catholic Education Resource Center: The Liturgical Season of Advent. Another website with information is Fish Eaters. For more information concerning Advent please see the Advent/Christmas Compilation. Pope Benedict XVI also released his advice on preparing for Christmas in Advent. What a busy day! Today is that day where everyone gets up at incredibly early hours and goes shopping. The stores are so packed, but this is the main shopping day for so many people because of the sales. Today has been the day to put up our Christmas tree for years. It's a tradition in our family. Also, I need to buy an advent wreath today and bless it Sunday for the first day of Advent. I got a new book called, "On the way to Bethlehem" by Hilary McDowell with a small reading and prayer for each day of Advent. Blessings to everyone in this Christmas season. Remember the poor and suffering; I always give to charities at this time. Give to those in poverty during Christmas especially since Christ Himself chose poverty that day in Bethlehem. Pray for unbelievers, heretics, and schismatics. Pray for the salvation of all souls. November is the month for the holy souls in purgatory, and this month is almost over. I would like to share a prayer attributed to St. Mechtilde. This is the "Our Father" for the souls in purgatory. When St. Mechtilde one day offered her Holy Eucharist for the souls, Jesus came to her (he has come to many saints) and told her to pray one "Our Father" for them. After she recited it, she saw many souls rise up to Heaven. THY KINGDOM COME; I pray You, Father Most Good, pardon the Souls in Purgatory, for they did not always seek or adore Your Kingdom with enough fervor and diligence;This Kingdom, the only place where true rest and peace reign. In reparation for their omissions, through indifference to do what is good, I offer You the Most Holy Desire of Your Son, by which He wished that they also might become heirs of His Kingdom. AND LEAD US NOT INTO TEMPTATION; I pray You, Father Most Good, pardon the Souls in Purgatory, because too often they did not resist temptations and the passions, but they followed the Enemy of all goodness. In reparation for all these sins, in thought, word, and deed. I offer You the glorius victory which Our Lord won against the world, as well as His Most Holy Life, His Work and Sorrows, His Suffering and His Most Cruel Death. 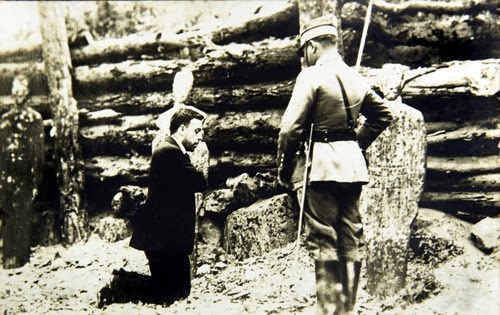 Blessed Miguel Agustín Pro (1891-1927) died from religious persecution by President Plutarco Elías Calles in Mexico in 1927 by firing squad. He refused a blindfold and forgave his killers. And as he died, in an expression of love, he opened his arms and screamed, "¡Viva Cristo Rey!" (Long live Christ the King). Those were his dying words to his executioners. He is a great example of what to be thankful for. Thank God today for the gift of the Church and its sacraments to lead us to Heaven. Thank Him for the Eucharist, the Bread of angels and delight of all souls. Thank Him for the gift of His Mother He made on the Cross. She stands by us on our journeys to Heaven. Thank the Lord for His merciful Heart pierced on the Cross. Thank the Lord for His wonder and beautfy. After all, the Lord our God is the delight of our hearts. This is part three of a story about my Rosary. After Mass on October 16, my Rosary was actually taken from my pew while I was away in the sacristy, and I have never found it. This is the third post on this subject. Well, recently the organist brought in several rosaries for me to look at. He was very kind and told me to take any of the rosaries. Several are from Fatima. One has the medal of Blessed Mother Teresa. All of them are beautiful. I chose, though, a wonderful, leather-bound prayer book to make up for my prayer book also taken. In addition, there was a beautiful picture of the Virgin Mary in the bag and I chose that. My parish's pastor already gave me a beautiful St. Patrick Rosary as a replacement. I wanted to thank everyone for their prayers. I only hope my Rosary and prayer book were taken by someone that could use them. With Advent officially beginning this Sunday a new liturgical year has approached. I will be posting a lot but mark your calendar. The St. Andrew Novena Prayer is a great devotion beginning on Nov. 30th and visit St. Margaret Mary's Parish for their great Advent Calendar. 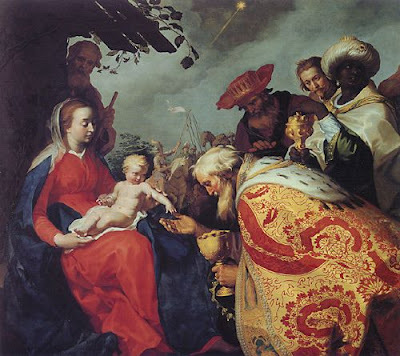 Each day opens as a countdown to Christmas, the birth of Our King. Hector recently asked about my home enthronement, so I wanted to explain. This is a devotion that recently developed in my area; I had my home enthroned on the Feast of the Transfiguration this past summer. We even remodeled part of our home and turned the room into a prayer room. 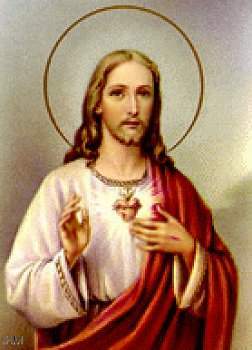 The devotion is based on the Sacred Heart of Jesus and the Immaculate Heart of Mary. Each family receives the two images and places them in a prominent place on the wall a few days before the main ceremony. 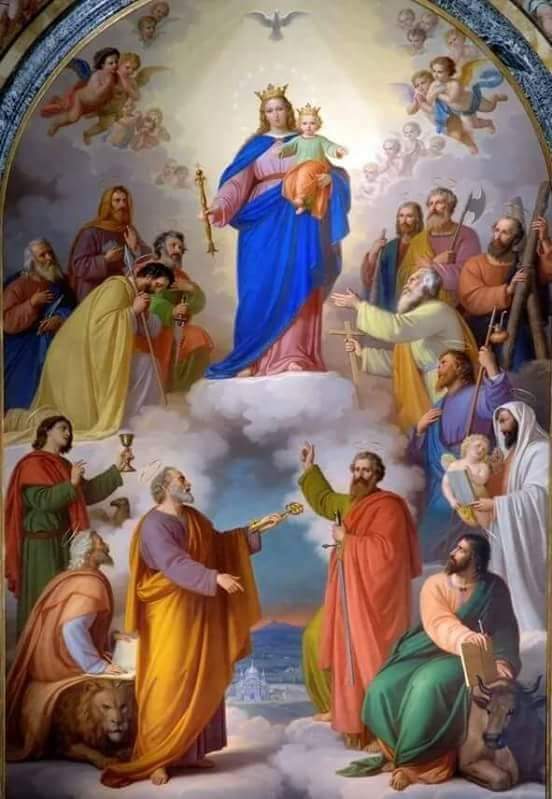 Then the Legion of Mary came to our home along with our priest, although a priest is not required, and we read a series of prayers for the enthronement. Afterwards each member of the family signs a piece of paper pledging to say certain prayers each day. The evening prayers include three Hail Marys, three Glorias, three times: "Sacred Heart of Jesus Have mercy on us" and a few others. The devotion has really been a blessing and the promises for this devotion are truly wonderful as well. Feast of Christ the King! Today is the end of the Church's liturgical year and the Feast of Christ the King remembering that Jesus Christ is to be, above all, our King and God. All of our laws and decrees must come under His Most Holy Will. May the Lord reign in our homes and hearts forever! I recently had a home enthronement where a picture of the Immaculate and Sacred Heart are placed in my home, and I pray everyday to Christ, our King. For more information on the Feast of Christ the King, see my post entitled Solemnity of Christ the King. Just a few days ago my great aunt, Lorraine, died. She was a devout Catholic her whole life and was legally blind. Please say a prayer for her soul. All of us will one day have to encounter end-of-life issues either for our loves ones or ourselves. And for those questioning cremation or wanting to know why euthanasia is wrong, I offer a great post on In Veritate Ambulare. Many people live in the misguided opinion that organized religion is not necessary. They believe in the here and the now while rejecting the calling of God to live as a community of faith, in communion together. Those who think they can be "spiritual but not religious" are living in an illusion. The entire purpose of the Catholic Church is to be the means of salvation for the entire world. The Church was created by Jesus Christ Himself (cf. Matthew 16:18) and founded on St. Peter, the first Pope. Each of us is internally called to worship and love God to the fullest possibility. In Elements of Religion, Henry Liddon states that: “Morality severed from religious motives is like a branch cut from a tree; it may, from here and there, from accidental causes, retain its greeness for a while, but it’s chance of a vigorous life is a very slender one.” God alone is the source of all morality as all were created by Him and deserving of respect; lack of religion destroys true morality. The work of Redemption consisted in the discharge of this threefold office (of Priest, Prophet, and King). On the eve of His departure from this world Christ delegated His powers to His Apostles: "All power is given to Me in heaven and on earth: going therefore, teach ye all nations, baptizing them in the name of the Father, and of the Son, and of the Holy Ghost, teaching them to observe all things whatsoever I have commanded you: and behold I am with you all days, even to the consummation of the world" (Matthew 28:18-20). From this commission of Christ, it is evident that His followers form an organized society under the leadership and guidance of the Apostles and their successors, with the right to teach and to command on one side, and the duty to be taught and to obey on the others..
Everything is visible about His great institution: Baptism, which is necessary for membership, the other Sacraments which He commanded His followers to receive, the rulers and lawgivers whom the faithful must obey, the tribunael before which the faithful are judged and to which they have a right to appeal. For those looking to learn about the Catholic faith or the answers to questions such as “Why Organized Religion” I encourage the book “This Is the Faith” by Canon Francis Ripley as well as the CatechismClass.com Program. Here are some dates I just wanted to inform others of. Sorry about not blogging as good and normally as I do. I am over my busy week and can spend much more time on blogs now. The United States Conference of Catholic Bishops released a statement that it is "time for our nation to abandon the illusion that we can protect life by taking life." The USCCB has announced a new website to help fight against the death penalty because it destroys the sanctity of life. We know that many of these people are guilty, but who are we to punish them? Are we God? Catholic Campaign to End the Use of the Death Penalty. "Blessed are the merciful for they shall be shown mercy". It is about what is to come, leave the punishment up to Christ, the King. Trust in Him and follow Him; don't try and be a judge when there is but one God, the most perfect judge who knows right from wrong in all cases. If we declare a person to deserve no better than death than what do you think our mortal sins justify? Mortal sins are deadly; it is by God's mercy that we can be forgiven. Again, I ask catholics to stand up for life...the life of every last person, guilty or innocent. God, in His time, will declare mercy and justice to all. Today is the feastday of St. Gertrude, virgin and mystic, who received authentic visions of Christ and a prayer for the souls in purgatory. St. Gertrude also received the stigmata. Our Lord gave her a prayer for the souls in purgatory, which He promises will release 1,000 souls each time it is said, though we shouldn't assume this when we pray it. St. Gertrude (1256 - 1302) was raised in the Cistercian abbey of Helfta, Eisleben. She lived devoutly and spoke fluent Latin even though her health was poor. At the age of 25 (1281) she began to receive visions of Christ, where He disclosed to her the secrets of mystical union. She was extremely intelligent in her studies and a caring person. 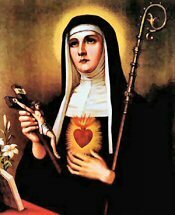 St. Gertrude helped spread devotion to the Sacred Heart as well. She died in 1302 AD, consumed with burning love for Christ. "Each time a person receives Holy Communion, their place in Heaven becomes greater and their stay in purgatory is shortened." While she was meditating on The Blessed Sacrament and wondering how our Lord could bring Himself so low as to live on our altars in the form of bread, Jesus Himself told her this story. A little prince, living in a huge palace filled with toys and games of all kinds, looked out of the window one day and saw some poor children playing in the street. Noticing the little boy looking out, his tutor asked him: "Would you like to stay in the palace today or go out and play with those children in the street?". "I would love to go out and play with them," answered the prince. Permission was granted, the prince put on the oldest clothes he had and played all day with the poor children in the street.It was one of his happiest days.Then our Lord said to St. Gertrude: "I am like that little prince, I like to be with you men and women.Whoever keeps people away from Communion deprives Me of a great joy." O God, Who in the heart of the holy Virgin Gertrude didst provide for Thyself a pleasant dwelling: through his merits and intercession, so Thou, in Thy mercy, wash all stains from our hearts and grant us joyful fellowship with her. Through our Lord. There are now 67 people who have been officially declared as healed from their visit to Lourdes. This particular woman went there around 50 years ago and was cured from a rheumatic heart disease. Many, many more people have claimed to have been cured even though only 67 have only been investigated and declared as official miracles thus far. 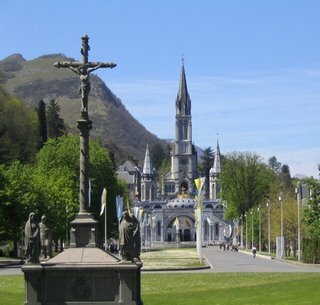 Lourdes is an immensely spiritual place after the Virgin Mary appeared to St. Bernadette in 1858 and showed her a hidden healing spring in the town. Again, this is not a required belief to be a Catholic but another Testament of the joy of being with the Joy of the World, Our Lord and God, our Healer. Charity is one of the three theological virtues placed upon a soul at baptism along with faith and hope. Charity, however, is lost after a mortal sin is committed. Mortal sin destroys sanctifying grace and only through Confession can we "wash our robes clean in the blood of the Lamb"; by seeking Christ in forgiveneness we put ourselves in the right place again - humbly below God. I particularly love the last line - in Christ we gain all truly great things. For the Good Shepard laid down his life for His sheep. Ask yourself would you lay down your life for him? For your fellow man? Do you ask yourself "How much do I love"? But more importantly...do you act on it. Love Christ and preach His Gospel in the Catholic Church for all generations. We live for Christ, Our God. Alleluia. "In God is our trust"
Update: The Motto is to remain! In America we have a Freedom to Religion not a Freedom from religion. Atheism is a lie and nothing more! Just tonight I found out that the same man who has filed suit for "under God" in the pledge of Allegiance to be removed has now filed suit against "In God is our trust" on America's currency. He is expected to win the case in the circuit court and take it to the Supreme Court. “Every one therefore that shall confess me before men, I will also confess him before my Father who is in heaven. But he that shall deny me before men, I will also deny him before my Father who is in heaven” Matthew 10:32-33 (Douay Rheims). Today Pope Benedict XVI will move three people closer to being declared a saint by declaring them blessed. They are Charles de Foucauld, Maria Pia Mastena, and Maria Crocifissa Curcio. Their beatification ceremony is being aired on EWTN tonight. I will post more after their beatification tonight. Today we celebrate the Memorial of St. Frances Xavier Cabrini, who shows us another example of today's gospel of living our faith. 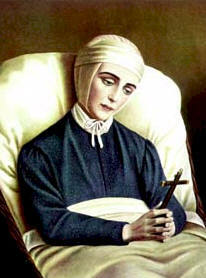 Born in Lombardi, Italy in 1850, she desired to be a nun by the age of eighteen, but her poor health prevent her. St. Frances helped her parents until their death and afterwards worked on a farm with her brothers and sisters. 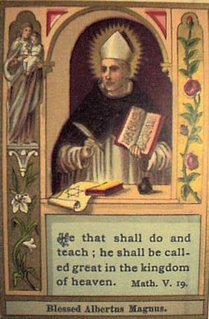 Following the request of a preach, St. Frances began to teach in a girl's school, and she taught there for 6 years. Later, at request of her Bishop, St. Frances Cabrini founded the Missionary Sisters of the Sacred Heart, a religious order to care for poor children in schools and hospitals. At the urging of Pope Leo XIII she came to the United States in 1889 with six nuns to work among the Italian immigrants. She lived tirelessly for the poor and founded 67 institutions to help the poor and misfortunate in a period of 35 years. At the time of her death, on December 22, 1917, in Chicago, Illinois, her institute numbered houses in England, France, Spain, the United States, and even South America. St. Frances became the first US citizen to ever be when Pope Pius XII canonized her in 1946. "Holy Spirit, when Saint Frances was a child, she pretended she was a missionary to China as she sailed paper boats on a stream. Although You eventually sent her west to America instead of East to the Orient, her childhood games shaped her desire to serve You. I ask her to pray for our children to be protected from the lure of games that are worldly, violent, or occultic. O Lord, prevent society’s influences from blocking their desire to serve You when they grow up. Touch their souls to make them uneasy about games that erode their love for You and teach them to listen to Your guidance. Saint Frances, pray for us. Amen." "You wicked, lazy servant! So you knew that I harvest where I did not plant and gather where I did not scatter? Should you not then have put my money in the bank so that I could have got it back with interest on my return? Now then! Take the talent from him and give it to the one with ten. For to everyone who has,more will be given and he will grow rich;but from the one who has not,even what he has will be taken away. And throw this useless servant into the darkness outside,where there will be wailing and grinding of teeth." This reading has nothing to do with earthly wealth. Those Christians that claim the rich are blessed by God are just plain wrong. The poor are blessed as well. Above all, this reading is talking about virtue and grace - not monetary value. This is what happens when our faith is buried - it dies. Just as last week's gospel shows us, we don't know when the end will come for us, so we must be ready all times. Let us live each day as if there would be no tomorrow and serve God and our neighbor completely. I heard on the Word on Fire Sermon today on the way home from Mass of five tips on how to keep our faith open. Here they are; I recommend trying them out. Wear your faith whether it is a cross or a picture of a saint. And if the opportunity comes when someone asks about it, talk about our faith and its importance. Pray grace at meals. Don't pray loudly like Our Lord warned for attention, but pray to God and don't abstain from saying grace because you are in public. Live the faith because if you say grace someone a few tables over may decide to say it for the first time in years. Don't circumvent talking about the faith. We all know someone that has fallen away from Church or our friends that are not Catholic. Don't shy away from discussing our great faith. As baptized Catholics we all are part of the larger goal of evangelization of the world; in the words of John Paul ll, "How can they believe if they have not heard?" And the final opportunity I heard was to take a rare (only happens about once or twice a year) opportunity to bring someone to the faith. Let them know about what the faith is, its teachings. Ask them if they would like to go to Mass one day. The most important thing is using your talents for God. We have so many different talents, but all of them belong to God who gave them to us. Let us serve Him in every way possible. Hello, my fellow blog readers. I'm sorry if blogging has been light, but it will probably be light for the next week. I've been rather busy and a lot of my free time is being spent on updating my Eucharist FAQ (I'll post an update when I'm finished with it) and the Catholic Wikipedia (now it is defunct). I just wanted to update everyone and thank all of my readers. My plan is also to begin another Catholic Discussion Topic. So, let me know what issues you want to discuss my replying below. Friday I will annouce the topic and next Sunday I will post my view on it. I also ask my readers to send me their comments and I will post them on my blog too. Topics can be items such as "Tradition vs. Bible", morality issues, or women in the priesthood. If there is something you'd like to talk on and here other's opinions then just comment below. Also, please don't repeat past topics: death penalty, contraception, and poverty. Back in the Old Testament, the Ark of the Covenant was the holiest of holies in which no mere man could touch and not die. And, when Uzzah touched the Ark he was slain by God because the Ark is undefiled and has no place in sin. Inside contains what, at that time, was the most important objects by God, and no mere man could touch them. God is completely filled with glory and power, yet He also loves us beyond recollection. In the Old Testament, the Ark of the Covenant contained the most holy objects: The Ten Commandments, manna, and Aaron’s staff. These objects were directly linked with God and were greatly special, but it is further true that these objects were not God. This ark was so holy no one could touch it and not die except the chief priest one day a year, but these objects still are nothing compared with Christ, who is the epitome of holiest. Now, Mary is the Ark of the New Covenant, which holds a much more powerful object than manna or a staff – Christ Himself. Mary is the holiest of all humans having carried within her the greatest splendor - Our Lord. Let us look at Luke 1:35 where the Archangel says to Mary: “The Holy Spirit will come upon you, and the power of the Most High will overshadow you.” This word “overshadow” comes from the Greek word "episkiasei", which refers to a glorious instance. This same Greek term was used previously in Exodus 40:34-35 to describe the Temple; the clear resemble to the Temple and Mary shows again the Mary is to be a great temple for God to come into the world and save us. She is the new Ark that held the greatest gift to the human race, and she must have been pure and sinless to be able to carry the Lord within her. Some say that making Mary into the Ark of the New Covenant shows we worship her, but we do not worship her just as the people of the Old Testament did not worship the ark itself. Instead, what was inside of the Ark was adored just as we adore the treasure inside Mary, who is Our Lord. Let us remember every time we say the Rosary that we recall God’s saving power through her willingness to humble herself. Luke wrote this parallel under the careful guidance of the Holy Spirit along with his account of the Visitation, which also show reference to Mary being the Ark of the New Covenant. In Luke 1:39 it states that Mary rose and went to her sister resembling the man, Daniel, rising in 2 Samuel 6:2. Also, further in Luke 1:42, upon Mary’s visit to St. Elizabeth, St. John the Baptist leapt in his mother’s womb alluding to 2 Sam 6:16 where King David leap for joy before the Ark of the New Covenant. Finally, St. Elizabeth responded to Mary by asking, “How can the Mother of my Lord come to me,” but this, once again, resembles Old Testament writings especially in 2 Sam. 6:9: “How shall the ark of the Lord come to me?" These instances of the Old Testament mirroring the New Testament show us how many occasions, from the grace of baptism mirroring the Great flood to the Bread of Life first mirrored in the manna in the desert, relate to each other. However, even though the image of Mary as the Ark is resembled very accurately it does not have to mirror it completely. For example, scholars indicate that King David mirrored Christ, but King David did commit sins unlike the Lord; the same finer details can be seen in the Ark where the Old Testament Ark was stolen, but the New Ark is now safely in Heaven. Just as the Ark of the Old Covenant was worthy of praise, now an even greater Ark has come along with an even greater object in the Ark, Our Lord. We should remember this during the “Hail Mary” when we say, “The Lord is with thee,” because Mary is also deserving of honor, though less than God, but honor nonetheless. In 1 Chron. 15 and 16, the Old Ark is surrounded by hymns, veneration, trumpets, and other glorious actions. During the Hail Mary we take part in a new hymns and trumpets and proclaim Mary is truly blessed to have been made the Immaculate Ark of the New Covenant through whom Our Lord could take flesh. Today is the feastday of one of the few saints who have the informal title of "great" - St. Leo the Great (c. 400-461), pope and Doctor of the Church. He is a shining example for apologetics. St. Leo was an eloquent writer and homilist. He wrote exceptionally well on St. Peter and the papacy as founded in Matthew 16:18. However, St. Leo also fought extensively against heresies and preserved Church teachings. 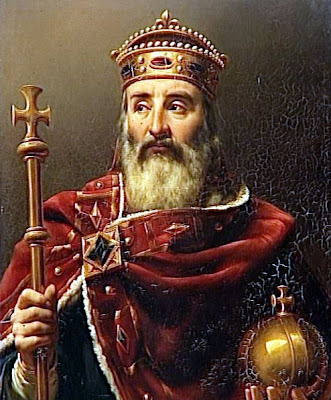 He was pope from 440 to 461 AD during the invasion of Attila the Hun. When Attila marched on to Rome, St. Leo went out to meet him and pleaded for him to leave. As Leo spoke, Attila saw a vision of a man in priestly robes, carrying a bare sword, and threatening to kill the invader if he did not obey Pope St. Leo. It is believed that the visionary was St. Peter, to whom St. Leo had a great devotion. Attila the Hun, one of the most brutal barbarians in history, left. St. Leo won without a life being lost. Look forgivingly on Thy flock, Eternal Shepherd, and keep it in Thy constant protection, by the intercession of Blessed Leo, Thy Sovereign Pontiff, whom Thou didst constitute Shepherd of the whole Church. Through our Lord. I'm looking to help make things clearer and create a whole post on abortion laws state by state. This is rather long, so I'm just looking for the whether their is a parential notification law, a parental consent law, or other abortion related laws state by state. Also, how many abortion clinics are in each state, so we can pray even deeper for that one to shut down. I know for a fact that North Dakota only has 1 clinic left. For info. on abortion laws by other countries around the world visit this post of mine. There are lies out in the world. This is the honest truth - some people hate others and live a life devoted to violence; they are living lies as we are all children of the same God. We are called to holiness. All are called to enter God's House in Heaven. Of these lies, some people deny God's existence and His love, which is poured out into each of us when we receive Him in Holy Communion. Christ's love for us is incomparable; on His sacred shoulder rested the wait of the world. I was carrying a heavy bag today and thought of how horrible it would be to carry the world on your shoulder; and Christ did it for love of us! There are also people who deny the Holocaust. This is a blatant lie; during the Holocaust millions of people: Jews, homosexuals, gypsies, and priests died in horrible concentration camps. Yes, 4,000 priests died for their beliefs and love. We have the survivor's stories, their pictures, their memories. We have a small piece of history remaining only today though as many of the survivors have already died from old age. Today I had the chance to hear a speech in my community by a survivor of the Holocaust. He spoke about hate and how he knew it. He spoke about how he saw people murdered (his brother brutally and his parents and uncles and aunts). He spoke of people being lit on fire alive and how could they do this. How did the anyone know they were Jewish? Because people told on them. They would scream, "Jews live here! And there! In that house too!" It was a world of hate and pain. These people were not pressured to tell; they wanted to tell. It was hate. I also disagreed with the gentleman though on some claims such as that "Christ was a Jew; a creation of God." We know that Christ is God and not a creation of God but eternally begotten of the father. This, though is no reason we should hate others. The speaker today even spoke so highly of Pope John Paul ll. Why? Because Pope John Paul ll was a Pope of love. He spoke against the Holocaust, Communism, and other attacks on life. Pope John Paul ll in this speaker's words was the "greatest pope in history" because of his tolerance for others. So many people could have helped these poor people but didn't. In the end, people blame the Church for not doing enough. But in truth, it was us as a people; not us as a Church. The Catholic Church saved nearly 800,000 Jewish people from death in the Holocaust (Read More). In today's world, we no longer have a Holocaust but a different one. There is one directed against the elderly by legalizing euthanasia, one against the unborn child in embryonic stem cell research and abortion, and a holocaust against love. People are trying to take God out of life and make the world secular. This is an outrage! I hope those of you that have read this post can one day soon listen to a holocaust speaker. It was 1 1/2 hours long but filled with pain - pain knowing that no one cared when he cried out. Trust the Lord, receive Him in the Eucharist. Love Him as He loved you and listen. Listen to Our Lord. 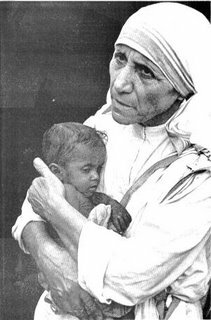 Take the Crucifix in your hands, as Mother Teresa said, and what a sermon you will hear. And what is the sermon on? It's on love - the foundation of our Faith as God is the God of Love. Today I'm going to be hearing a speech from a survivor of the Holocaust that was in several concentration camps. It's a piece of living history and a dark time though God's love shone down through the clouds to us. There is a lot of misguided opinions that the Catholic Church didn't help holocaust victims, but they did! I'll try and post information later tonight. "I believe in the sun even when it is not shining. I believe in love even when I cannot feel it. I believe in God even when He is silent." (an anonymous prisoner of the Holocaust). Prop. 73, which would have required parental notification and make California the 35th state in the US to have such a law, failed very, very narrowly today. With 83.9% of precincts reporting 51.8% of voters rejected it to 48.2% of voters supporting it. Those working to defeat this included Planned Parenthood ($1.1 mil. dollar donation), the California Family Health Council, the American Civil Liberties Union of Northern and Southern California, and state and national chapters of the Abortion Rights Action League. It is very saddening to see a state turning down an opportunity to save lives. How sad is this day in US history when California could have saved lives and turned them away. Let's remember Our Lord's words that whoever shows mercy will be shown mercy; I pray abortion will be illegal soon enough. God bless all of you that voted for Prop 73 or at least supported it in your prayers. Rest assured, that even though this is a minor setback on getting abortion made illegal, that abortion is wrong. Our great Lord, who knows each of us, knows those of us that supported those little ones. Post-election update: Prop. 73, failed very, very narrowly. With 83.9% of precincts reporting 51.8% of voters rejected it to 48.2% of voters supporting it. Original Post: Today is an important day in California where they will be voting for Prop. 73, which would require parental notification in abortions. This would not only cut down on abortions and teen births but give parents their right to know. In California children need permission slips for school until 18 years of age, but abortion is okay?? Nov. 8th: Today is the special election in California where voters will consider Prop. 73, which would require parental notification. In other states this measure has had immense success at cutting down abortion and teen pregnancy rates. With November being a time to pray for the faithfully departed, let us never forget the power of the saint's intercession. Let us ask for their prayers to Our Lord through the Litany of Saints. Today I have not blogged much because I was volunteering today for an organization that raises funds for the disabled. This organization has an annual festival in my community with auctions and raffles, and I like volunteering there. As of today I'm happy to say that I have 3 years of volunteering under my belt. Christmas is such a great time to enrich our hearts again in Christ's love and an important time to share our talents with others. Whether it's giving food to the food pantry or volunteering for this organization each year, I love Christmas time. Advent is also rapidly approaching so I will be posting much more on Advent as time comes. November 2006 Update: The Catholic Wikipedia mentioned below, for a reason unknown to me, no longer exists. All work on there has been deleted. There is, however, a new Catholic Wikipedia project going on that is connected with the real Wikipedia. Help out if you can! Update: I've added a few posts and see there is still a lot of work left to do. So much of our faith needs to be covered there for the encyclopedia to become close to ready to help others. I encourage everyone to add some pages. Just click on a link for a page and if you think it should be edited then edit it. Don't be afraid about not understanding the software there. After a few posts I understand completely how to edit posts and put in links. Original Post: I'm the kind of person that loves using Wikipedia.com because it is the editable, online encyclopedia. 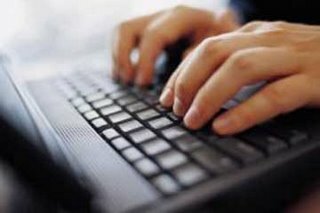 Anyone can edit and create pages so it constantly is updated with the latest information. I especially like going to the Catholic articles and others to spread the faith. For example, I added information to the In vitro fertilization article to point out that the Catholic faith is opposed to it. But now there is another encyclopedia online that can be edited by anyone and this is an entirely Catholic Wikipedia. Anyone can edit and I know many of my readers here could really help out the editing. Some of you are great on saint and others on pro-life issues. I know Paul from In Veritate Ambulare knows a lot about sacred vessels. So, I wanted to let everyone know that this project is now open in English because so many of you could help so much. Q: What is Holy Communion? A: Also known as the Eucharist, Holy Communion is the “source and summit” (CCC 1324) of the Catholic faith because it is truly the Body, Blood, Soul, and Divinity of Our Lord Jesus Christ. It is not in any way a symbol but literally Christ’s most Holy body. 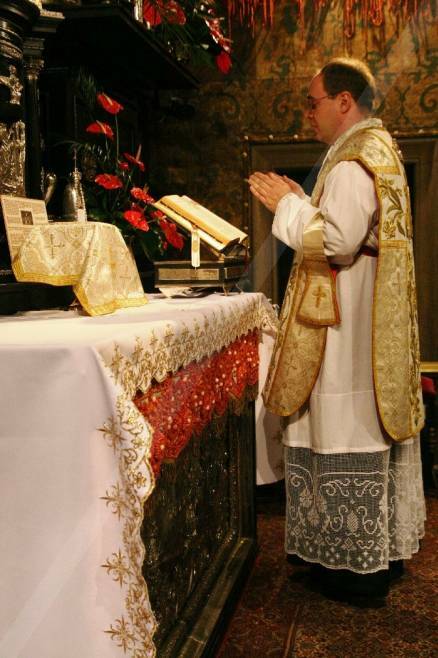 The bread and wine at the Mass become the holiest of holies through the priest’s words by the power of God. The moment when the Bread and Wine become Jesus Christ is called transubstantiation (CCC 1376). The entire Gospel of John Chapter Six even wrote specifically on the Eucharist and how Christ’s body is truly present. Some people that don't believe in the Eucharist say that Jesus meant for it to be symbolic. Well, then we look to the Gospel of John Chapter 6. That chapter is entirely on the Eucharist, and we see that when Our Lord tells them "Unless you eat my Body and Drink my Blood you will have no life within you" the people do one thing: they leave Him. If Jesus was speaking symbolically He would have said "No, you misunderstand" like He did before in the Gospels, but this time He just let them walk away. Thousands left Him, but He let them because what He spoke was literally true and they couldn't accept it. Q: Does the Sacred Host also contain Christ's Blood? Q: What are Eucharistic Miracles? 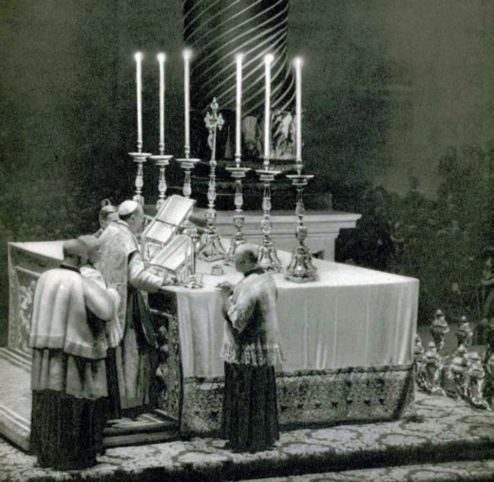 A: These are outward signs of the majesty of Our Lord’s true presence in the Holy Eucharist. I recognize this mirroring the Transfiguration when Our Lord on Mt. Tabor appeared dazzlingly white with Elijah and Moses. This was an outward manifestation of Our Lord’s immense greatness. The Transfiguration wasn’t in and of itself the greatest part of this mystery, but what is even greater is that Christ humbled Himself and kept in His immense glory while on earth. Q: If I suspect someone is taking the Eucharist from Mass without the intentions of giving it to the sick what should I do? A: If someone takes Communion back to the pew and doesn’t consume it PLEASE report it to the priest or another minister if the priest is unavailable immediately. Sometimes people will take Our Lord’s Body to desecrate it and this destruction of Our Lord in the Eucharist is a grave sacrilege. Q: Can Holy Communion ever be denied? A: It can be denied to individuals in a public act of scandal. For example, if one regularly known non-Catholic is at a Mass and wishes to receive Holy Communion it is to be denied. Holy Communion may - and should - be denied to those Catholics who promote intrinsic evils such as abortion, gay marriage, and artificial contraception. Also, if one suspects a person is going to desecrate the Eucharist it can be denied. Q: Are there special conditions on receiving the Eucharist? Q: How many times a day can we receive communion? Q: What act of reverence should we show before receiving Holy Communion? A: An act of reverence must be made before receiving Holy Communion because it is showing reverence to Our Lord truly present before us. 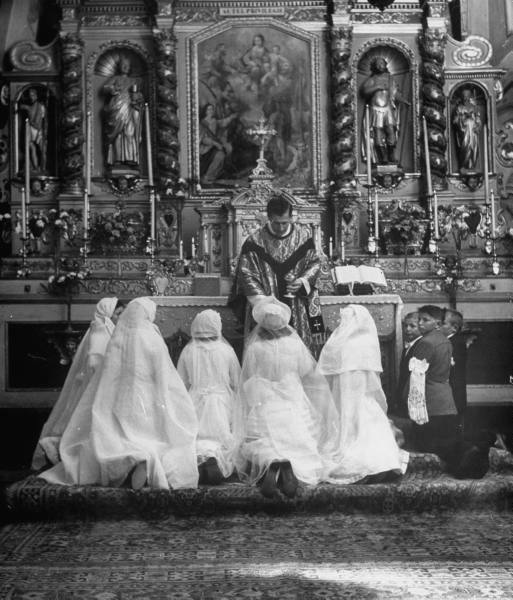 People are also still allowed to receive the Holy Eucharist while kneeling (GIRM 160), and Pope Benedict XVI gives Holy Communion to the Faithful at Papal Liturgies, who receive kneeling. Q: What is the Eucharistic fast and how long is it? A: The Eucharistic fast is a one hour fast before receiving Holy Communion to observe a period of reflecting and spiritual hunger for Our Lord. Only medicine and water are allowed before hand, but if one needs to eat for serious medical reason this can be circumvented. 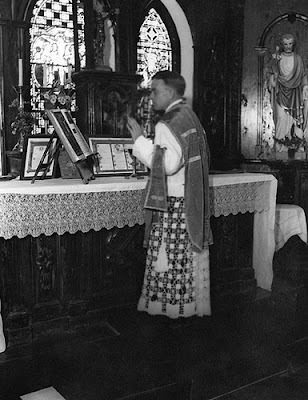 Note that a priest who celebrates the Eucharist two or three times a day can take something before the second and third Mass even if it is less than one hour before receiving the Blessed Sacrament again. Also, the elderly, ill, and those that care for them may receive the Eucharist if they have eaten something in the previous hour (Canon 919). Many Traditional Catholics will take part in the traditional fast, which was three hours long. Other Traditional Catholics will take part in an older form of the fast which mandated fasting from midnight until receiving Communion. Q: How often is one required to receive the Eucharist?